A group of scientists led by Nobel laureate Carlo Rubbia will transport the world's largest liquid-argon neutrino detector across the Atlantic Ocean from CERN to its new home at the US Department of Energy's Fermi National Accelerator Laboratory (link is external). The 760-ton, 20-metre-long detector took data for the ICARUS experiment at the Italian Institute for Nuclear Physics (link is external)' (INFN) Gran Sasso National Laboratory in Italy from 2010 to 2014, using a beam of neutrinos sent through the earth from CERN. The detector is now being refurbished at CERN, where it is the first beneficiary of a new test facility for neutrino detectors. When it arrives at Fermilab, the detector will become part of an on-site suite of three experiments dedicated to studying neutrinos, ghostly particles that are all around us but have given up few of their secrets. All three detectors will be filled with liquid argon that enables the use of state-of-the-art time projection technology, drawing charged particles created in neutrino interactions toward planes of fine wires that can capture a 3-D image of the tracks those particles leave. Each detector will contribute different yet complementary results to the hunt for a fourth type of neutrino. 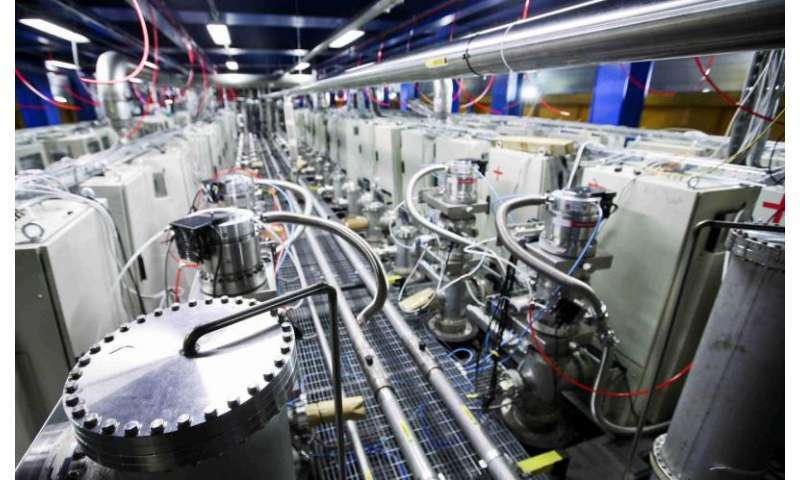 "The liquid-argon time projection chamber is a new and very promising technology that we originally developed in the ICARUS collaboration from an initial table-top experiment all the way to a large neutrino detector," Rubbia said. "It is expected that it will become the leading technology for large liquid-argon detectors, with its ability to record ionizing tracks with millimetre precision." Fermilab operates two powerful neutrino beams and is in the process of developing a third, making it the perfect place for the ICARUS detector to continue its scientific exploration. Scientists plan to transport the detector to the United States in 2017. A planned sequence of three liquid-argon detectors will provide new insights into the three known types of neutrinos and seek a yet unseen fourth type, following hints from other experiments over the past two decades. Many theories in particle physics predict the existence of a so-called "sterile" neutrino, which would behave differently from the three known types and, if it exists, could provide a route to understanding the mysterious dark matter that makes up 25 percent of the universe. Discovering this fourth type of neutrino would revolutionize physics, changing scientists' entire picture of the universe and how it works. "The arrival of ICARUS and the construction of this on-site research programme is a lofty goal in itself," said Fermilab Director Nigel Lockyer. "But it is also the first step forward in Fermilab's plan to host a truly international neutrino facility, with the help of our partners from around the world. The future of neutrino research in the United States is bright."